In a previous article we looked at very large one-day market falls, in this article we will add to the study very large one-day market gains. 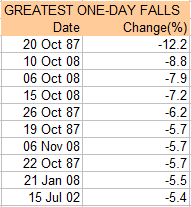 First, the following chart plots the very large one-day market gains with the losses for the period 1984-2014. As before, “very large gains” is defined as daily returns over two standard deviations away from the average return; in this case that is over +2.2%. As can be seen, there is a certain symmetry here: periods of large one-day gains seem to accompany periods of large one-days falls. This is not too surprising – a large bounceback often follows a large fall. However, the two are not always closely synchronised. 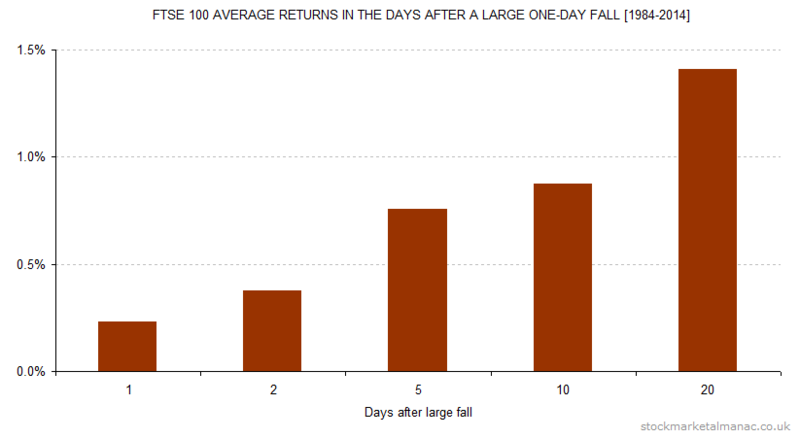 For example, although in the 30 years under study 169 days can be defined as very large one-day gains, only 26 of those large-gain days days were on days after large falls. 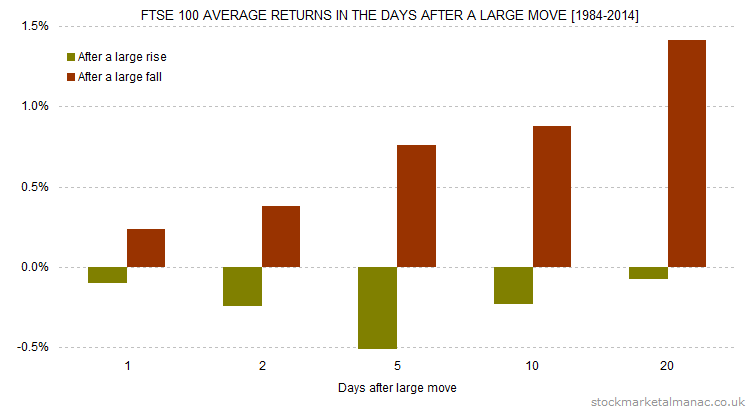 In fact, those 169 large-gain days followed days whose average return was only -0.21% (to be compared with -2.2% which is the minimum threshold for a day to be defined as a very large fall). It would be good to understand when these periods of higher volatility happen with respect to the prevailing market. 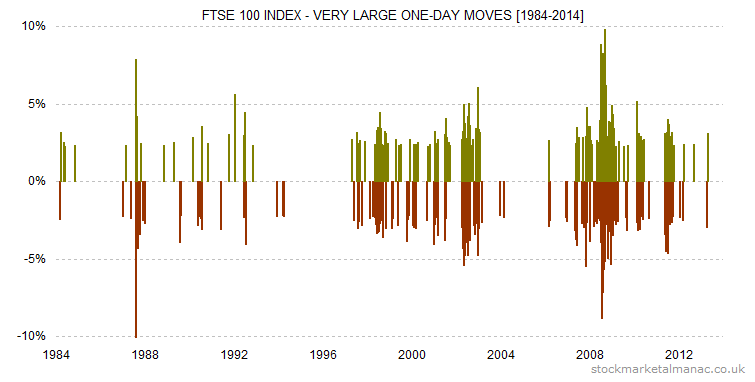 The following chart plots the very large one-day moves and superimposes the absolute level of the FTSE 100 Index. The following chart is the same as the above, but the periods of increased large one-day move frequency have been highlighted with grey boxes. The following chart shows the comparative performance of the market in the 20 days following respectively a large one-day rise or fall. The Y-axis is the percentage move from the close of the index on the day of the large move. For example, by day 5 the index has risen 0.8% above the index close on the day of the large fall. 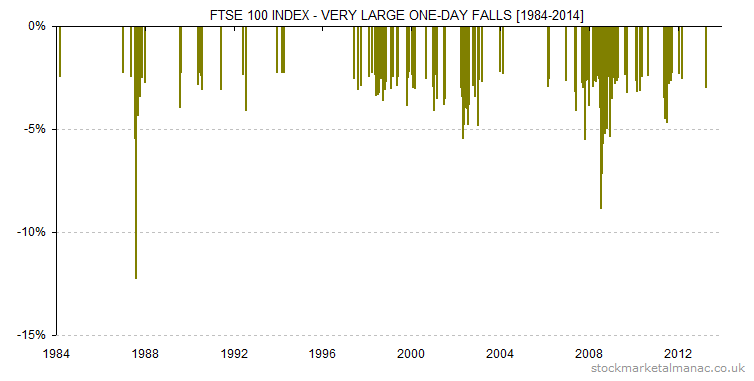 As can be seen, in the 20 days following a large fall the index has tended to rise strongly and steadily. In the 5 days following a large market rise the index tends to fall back losing some of its one-day gain, but the index then tends to recover and after 20 days has almost regained the level reached by the very large one-day rise. Other articles on large one-day returns.